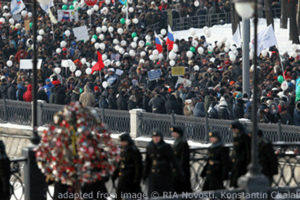 Sociologists like Oleg Zhuravlyev of Tyumen University say that there has been a major shift in the composition and attitudes of Russian protesters over the last decade. Compared to 2011-2013, protesters are significantly younger, from poorer groups, and further to the left. Those taking part in the earlier demonstrations against election fraud, he and other sociologists say, were middle class, averaging between 25 and 40 years of age, and with higher educations. Those doing so now are much poorer, much younger, and with as yet no higher education (russian.eurasianet.org/россия-протестное-движение-молодеет-левеет-и-беднеет). Many who took part in the earlier protests had something to lose and thus were profoundly affected by repressions against them. Those, far more that the “Crimea is ours” euphoria reduced their ranks, Zhuravlyev says. Indeed, many of those who did take part regardless of their views on Crimea felt their protests were separate from that issue. There were significant numbers of young people in the 2011-2013 protests, but they took their lead from the adults. Now that has changed, the sociologists say. Most of them now act without considering the positions of the older generation, taking part in or even organizing protests on their own. They have less to lose and are more influenced by the actions of other young people in much the same way as has been true in other countries. On the one hand, if protests are happening, they want to be part of that; and on the other, they will participate even if they are not all that enamored of the leaders. This politicization of young people, the sociologist continues, is in no way surprising. In contrast to their parents, they grew up at a time when protests were part of their lives. “Today’s youths,” he says, “are growing up in a politicized milieu, unlike their older brothers and sisters” and they feel that they can protest with much greater impunity. Sociological studies also show that the composition of protesters is changing not only as far as age structure is concerned but also by their social status. If the 2011-2013 demonstrations were dominated by the middle class, more recent ones have sprung from those lower down the social pyramid. As ever more poor people have come to take part, Zhuravlyev says, there has been a marked shift in protests away from middle class issues like ecology to left-wing causes like social equality and benefits. The failure of the leaders of the pension protests to tap into this kept those demonstrations from becoming as massive as they might have been. As protesters have become younger, poorer, and further left, Zhuravlyev says, they have also become more dependent on leaders to organize the demonstrations even if those taking part do not always support such people. And that gives the new protests a more populist and less elitist character than the actions of 2011-2013. It is possible this pattern will change if the middle class reenters the protest movement, the sociologist says; but at present, those taking to the streets are sufficiently different from those who did so earlier as a result represent a different and potentially greater challenge to the regime, one more class-based and more radical even if superficially less threatening to the powers.